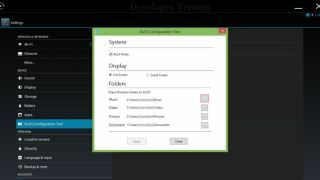 AMI's AMIDUoS allows owners of Windows 7 and Windows 8/8.1 computers to run Lollipop on their computer, including compatibility with Android's ART runtime, native support for 64-bit apps and more. Android 5.0.1 essentially runs within a virtual machine and accesses native PC hardware and drivers. That means that peripherals like the touchscreen, sensors, GPS, the camera and more can be accessed by Google's OS. What's more, both OSes integrate tightly; the clipboard is shared as are directories which means that you will be able to save files and open them independently on either OS. Running Android apps on Windows allow you to access apps that aren't usually available on a desktop or are not available for free. The application is currently in beta and costs $10 (about £6, AU$13) and comes with lifetime updates. AMIDuOS faces stiff competition from BlueStacks (which is free), Google's own ARC Welder Youwave, Genymotion and AndY.